Adams Chart of History is a 23' long by 27" tall, illustrated timeline of biblical and world history, covering a 6,000-year time period from the biblical creation to the late 19th century (1800s). The 21 full-size panels of this fold-out chart can be viewed in book form or opened as a continuous timeline to the full 23 feet. Seeing history displayed in this brilliant "at-a-glance" format helps us to fully understand and contextualize that every person or event is part of a much grander picture and purpose. A vintage reproduction of this famous illustrated time-line of earth history first published in 1871. The fold-out chart features detailed, full-color drawings of various stages of history, from Adam and Eve to the late 19th century, with handwritten commentary throughout. Discover ancient cultures like the Assyrians, Babylonians, Persians, Greeks, and more! Delight in the mysterious Seven Wonders of the World and learn where they once stood. Get the big picture of history and how it falls in line with a biblical world view! 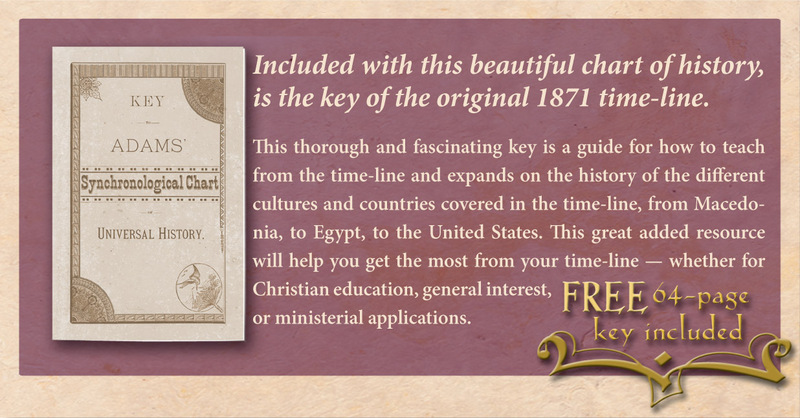 Have a virtual library conveniently at your fingertips with the incomparable Adam’s Chart of History - get your copy today! 21 full-colored panels, large format time-line that is easy to read. Nothing on the market in this size. Starts with creation at 4004 B.C. and goes to 1870 and our 19th President, R.B. Hayes.